Humans activity is unfortunately outpacing Coral Reefs’ ability to capacity to withstand environmental stresses. 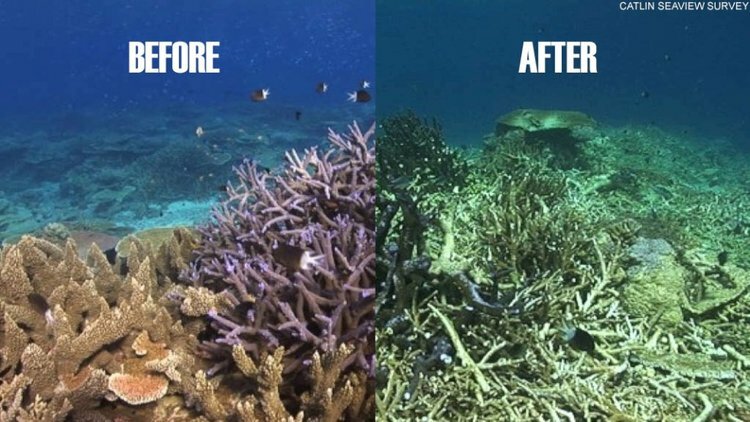 If we do not act to revitalize reefs, end climate change, and help corals adapt to their changing environments, vital reef ecosystems will not be able to survive our environmental impact. Without coral many marine ecosystems will die off, threatening terrestrial animal and human life as well. Our objective at Reefined Arts is to protect what few Reef Ecosystems remain and cultivate cutting edge solutions for coral survival. By fostering a future for coral we can protect all life on Earth. Coral Reefs provide economic services ranging from jobs, to food, shelter and especially tourism, estimated to be worth as much as $375 billion dollars per year (NOAA 2010). Most people don't know that coral reefs provide life and livelihood to almost 1 billion people worldwide and support 25% of all marine life (WWF). And yet, anthropogenic activities, such as development, commercial fishing, shipping, pollution, and climate change continue to threaten 75% of the World’s coral. Already, 60% of Coral Reef Ecosystems have been directly and seriously damaged (Ocean Health Index 2015). From the shallow island waters to the deepest parts of our oceans, Coral Reefs are disappearing. If, by 2100, nothing is done, approximately 24-50% of Global Coral Reef habitat will be irreversibly lost (Cacciapaglia 2015), costing the planet $84.0 billion dollars per year in lost livelihoods and ecosystem services (Global Compilation 2008). The facts and statistics are simple, damage to coral ecosystems is a direct threats to our survival as well. Pollution, temperature changes, increased exposure to sunlight, and changing tides induce stress on corals and upsets their symbiotic relationship with algae. When this happens, algae are expelled in what is known as bleaching. Without their algae, coral cannot perform vital life functions and quickly die off. Hit hardest and most recently was Australia's Great Barrier Reef. Spanning "348,000 square kilometers and currently contributing an estimated AUS $5.6 billion to the Australian economy, with an employment of approximately 69,000 full-time positions" the GBR is an ecosystem of critical global importance (Deloitte Access Economics 2013). “The Great Barrier Reef provides a natural significance which is so exceptional as to transcend national boundaries and to be of common importance for present and future generations of all humanity" (Kroom et, al. 2016). Over the last 27 years, coral coverage has declined by 50% across the entire GBR, and in some locations, such as the more developed central and southern GBR, coverage has declined by 70% (De'ath et al., 2012)." Even "despite the high level of national and international protection, the condition of the GBR ecosystems has deteriorated over past decades” (GBR Marine Park Authority, 2014). Global coral coverage is projected to fall below 10% what it should be within the next 30 years, threatening the survival of nearly a quarter of all marine species. To prevent this future, we envision large scale conviction to cultivation of specialized genus of corals which have proven to be naturally more resilient to hostile environments than others. Super Corals, as they are described in scientific literature, exhibit differences, from other genus, in the genetic structure of Host Coral and Zooxanthellae Symbiont. These differences allow these Super Coral to survive certain adverse conditions such as the acidification of ocean water and rising ocean temperatures due to Global Warming. 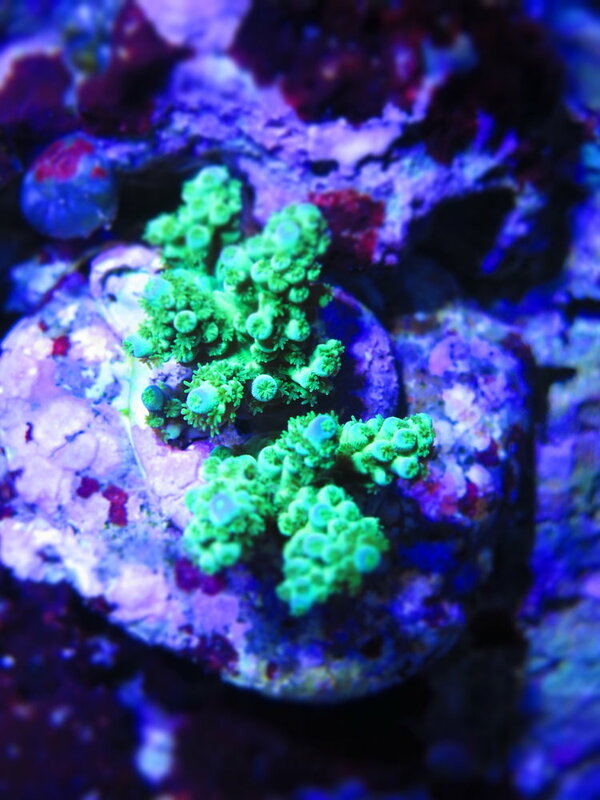 Above we have a strain of Acropora Super Coral! Super Corals such as this are identified, selected for, and cultivated through a process of Coral Mariculture. It is strong enough to survive the many perils corals face. One virtuous organization called CITES practices advanced Coral Mariculture, recording and tracking the survival of certain corals for the purposes of identifying corals that can help protect the ocean. Your jewelry will plant vital Super Corals such as these and help restore ecological balance to heavily damaged regions. Plant A Super Coral Now!